Captain Paul Boyer graduated from North Hagerstown High School, in June of 1983. He continued his education at Frostburg State University and earned a Bachelor of Science degree in December of 1987. 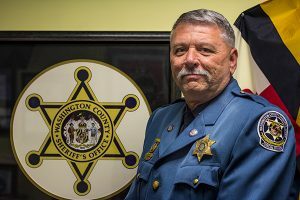 On January 15, 1990, Paul Boyer was hired as a Deputy Sheriff with the Washington County Sheriff’s Office. He attended the Western Maryland Police Academy and graduated in May of 1990. After a few months of being assigned to the Patrol Division, Boyer was transferred to the Judicial Division. In 2003 Boyer was promoted to the rank of Corporal. He was assigned to the Child Support Unit in 2005 and was promoted to Sergeant as the supervisor of that unit. On October 29, 2011, Paul Boyer was promoted to the rank of Captain and assigned as the Commander of Judicial Services. Lieutenant Cooper started his career in 1984 as a Police Cadet with the Hagerstown Police Department. In July 1985, he entered the Western Maryland Police Training Academy and upon graduation, was assigned to a patrol shift. In July 1986, he was hired by the Washington County Sheriff’s Office and during the next two years was assigned to road patrol, the Narcotics Task Force and as a Resident Deputy for the town of Williamsport. After being out of the law enforcement field for 18 months, Cooper returned in December 1989 and was hired by the Westminster Police Department. During his employment there he was chosen as Officer of the Year in 1991 and received the Governor’s Highway Safety DWI Award the same year. In October 1992, he returned to the Sheriff’s Office and was assigned to a patrol shift. In 1994 he was selected to serve as one of two newly created Resident Deputies for the town of Boonsboro. In 1995 he was assigned as the Domestic Violence Deputy and assigned to work alongside a nurse and clinician as a Domestic Violence Team through the Washington County Health Department. 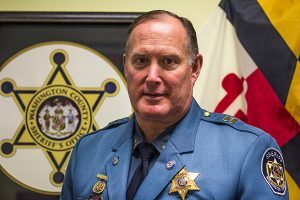 In 1998, the grant funding ended, but he continued to handle domestic violence investigations with the Sheriff’s Office. During this time, he started working on investigating and serving warrants on file at the Sheriff’s Office. The need was seen to have a full-time warrant unit and Cooper was one of two deputies selected to start the unit in July 1999. In October 2000, Cooper was chosen as the Sheriff’s Office Deputy of the Year. In 2003, Cooper was promoted to Corporal and in 2005 promoted to Sergeant. Seeing the need to consolidate warrants and manpower in the County, a proposal was made to create a county Warrant Task Force with the Hagerstown Police Department and Maryland State Police-Hagerstown. The Washington County Warrant Task Force was started on January 1, 2009 and Cooper was assigned as the supervisor. While in this position, he made numerous changes in the way warrants are handled to make the process more efficient. On October 29 2011, he was promoted to Lieutenant and assigned as the Assistant Commander of the Judicial Services Division, which is responsible for court security, civil process, warrants and civil orders. Cooper holds an A.A. Degree from Hagerstown Junior College.